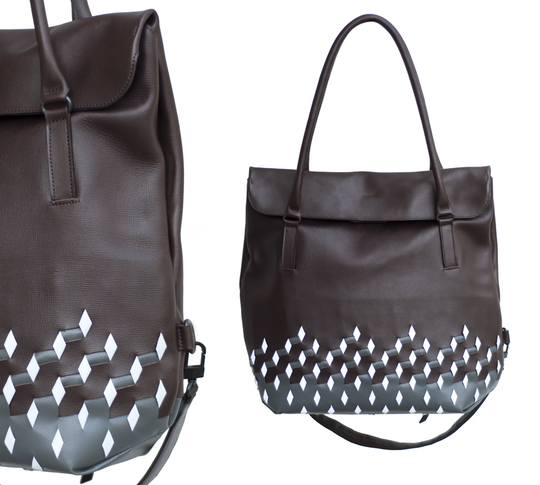 A series of bags for urban cyclists which perfectly combine practicality, elegance and safety. 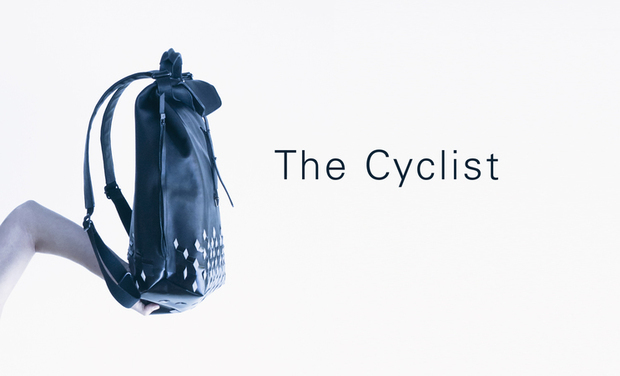 The Cyclist is a series of bags for urban cyclists which perfectly blends practicality, elegance and safety. 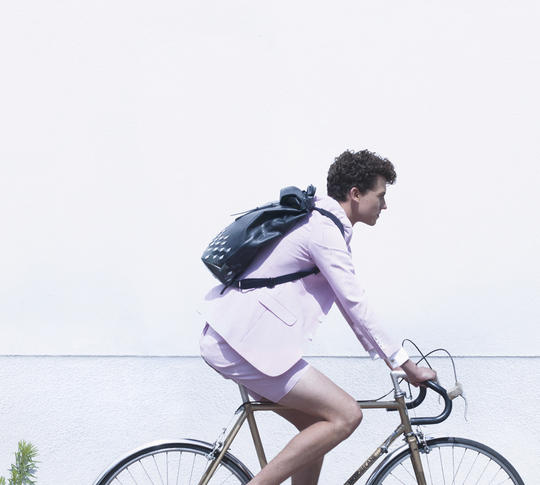 All bags of the collection are designed to fit the busy everyday life of urban cyclists. The starting point of the project is the wish for the bags to fulfill three requests which at first seem almost contradictory. First, the bags should be very practical, also while riding a bike. Second, at the same time they should also be elegant enough to be taken to work for instance. And last but not least, they should help to improve the safety of the cyclists while on the road. 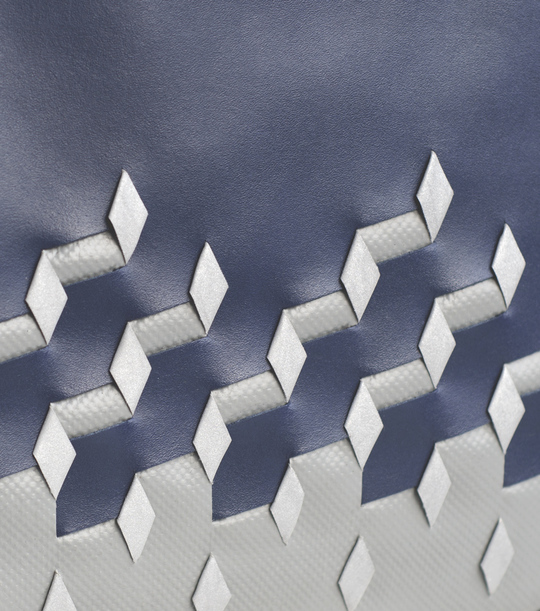 On the front/lower part of all three bags, ribbons of retro-reflective material are woven into the bag's surface. 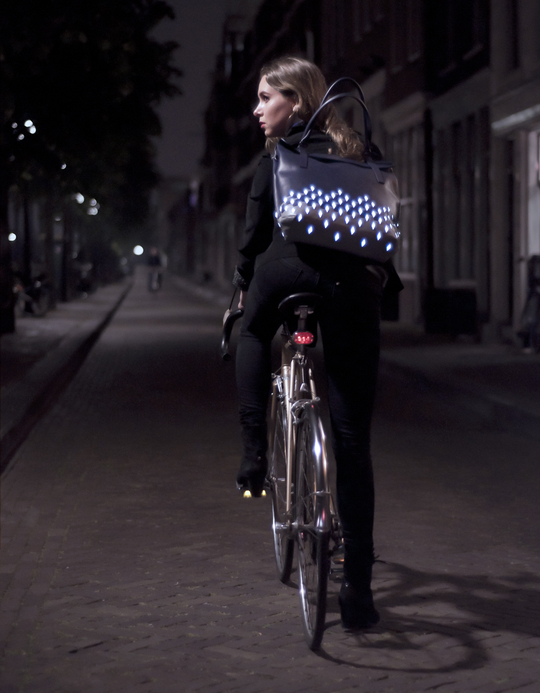 This woven pattern gives its unique appearance to the collection, but also has a safety function: the retro-reflective material lights-up at night under the front lights of passing cars, making the cycler more visible to surrounding traffic. This is a project by a young product designer with a passion for cycling and who believes that practicality, efficiency and a reduction to the essential should not be at all opposed to a sensitive, aesthetic, poetical approach. Beauty and practicality are complimentary to one another and even ornaments, patterns and decoration can become part of this equation. 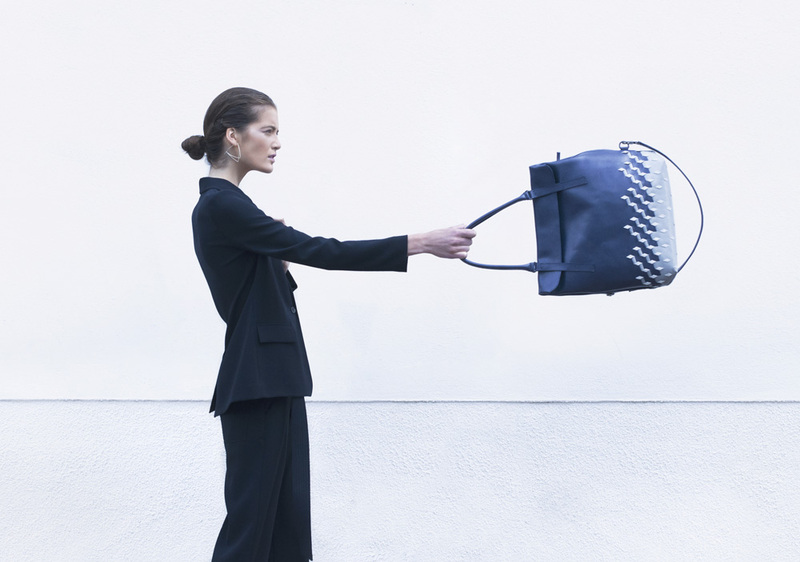 The collection is made up of three bags : Claude, Penelope, and Maddalena. 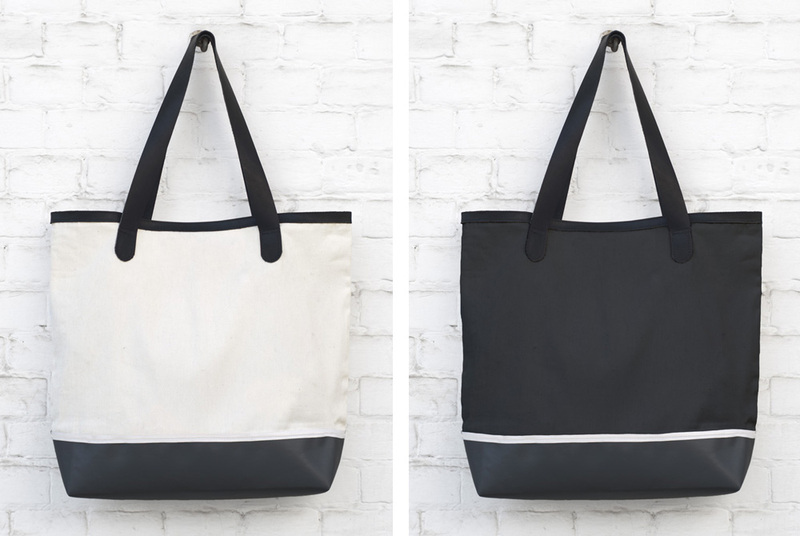 All three bags are designed specifically to fit the needs of city cyclists when it comes to transporting everyday items comfortably and efficiently, yet elegantly. The looks of The Cyclist's bags are inspired by high-end leather goods and the bag’s appearances perfectly blend into an urban life-style. 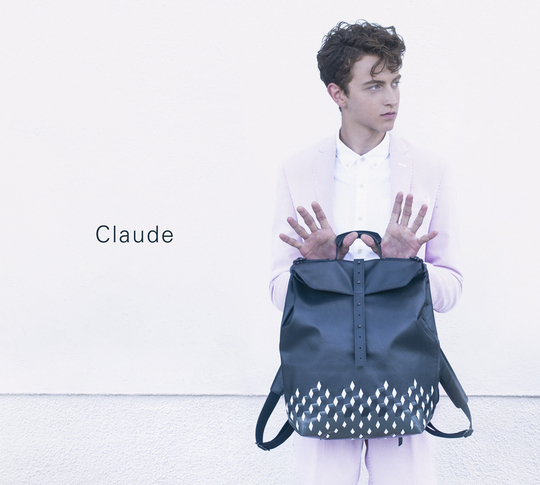 Claude is a unisex backpack. It has a big main compartment including a laptop section. There is small pocket inside the main compartment and another small pocket hidden on the outside’s lower back for items such as keys and your mobile phone. Penelope is designed for women who want it all. 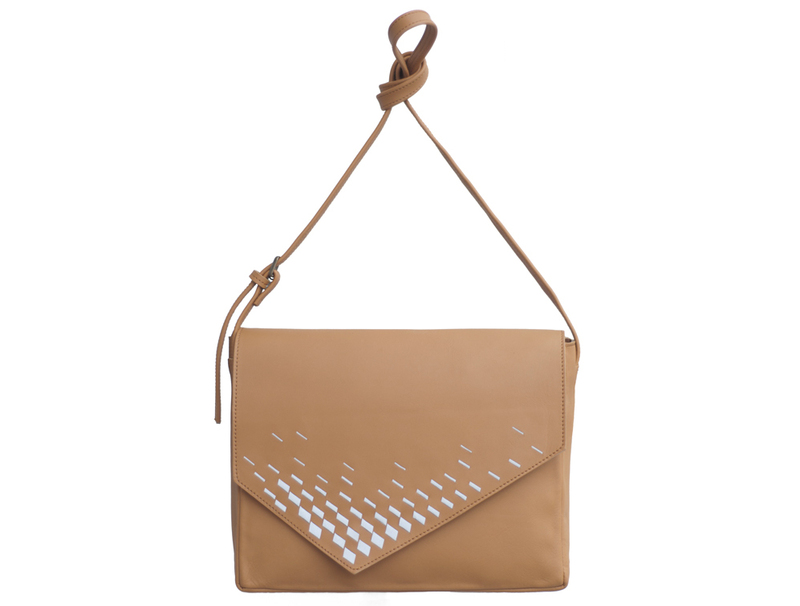 It is an elegant bag designed to carry around all the items needed for a busy work life and it is also suited for biking around the city. Maddalena is a smaller bag with a classical shape, but just like Claude and Penelope, its twist lies in the use of retro-reflective material, which is both a decorative and a safety element. 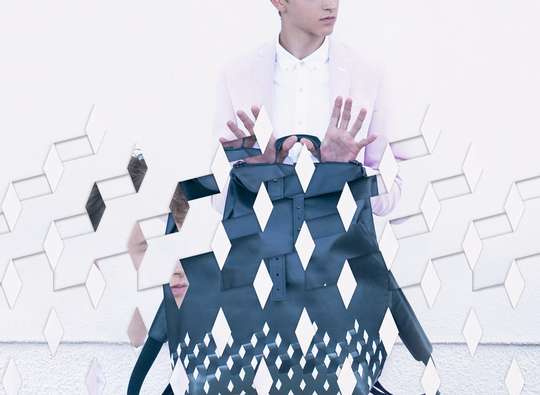 The Cyclist is a project by young French/Dutch product designer Julie Thissen. 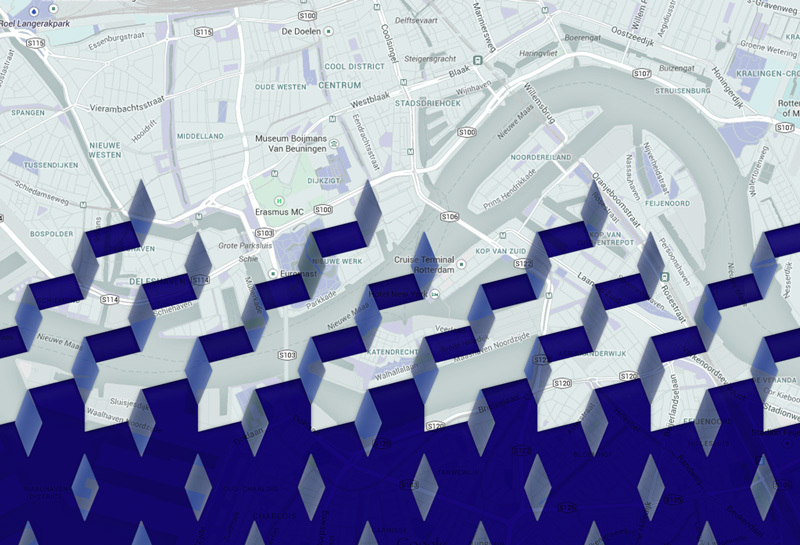 This project started as her master’s graduation project in the spring of 2013. It took one year of hard work after graduation to develop the project and make it ready for manufacture. In her youth Julie spent a couple of years living in The Netherlands, where biking is simply and unquestionably part of everyday life. She got imbued with the Dutch cycling culture and acquired her taste for the sport. Whether this means riding through rain, wind, hail or on a lovely sunny day, ultimately what she enjoys the most about cycling is the feeling of freedom it awards. At that point in time she spent the foremost of her free time producing all kinds of objects, clothes and other projects as an autodidact. Along the way she acquired skills and experience in the field of sewing and textile. From there, the step towards studies in product design seemed almost obvious. At the Parisian design school Ensci-Les Ateliers she discovered new materials and techniques such as ceramics, wood, glass blowing, bronze casting, bookbinding, leather working and computer assisted manufacturing techniques such as 3D printing. Here she developed her technical competences, her multi-skilled approach and she got acquainted with the French taste for aesthetics. For her graduation project, Julie wished to associate elements from her French and Dutch background. This includes on the one hand her passion for biking and her interest in a design approach where efficiency and practicality play a key role and on the other hand, her knowledge of materials and manufacture techniques as well as her feel for aesthetics. By allying her wish for efficiency and practicality to her taste for beauty and poetry in objects, she came up with a product specifically adapted to cyclists and where function meets aesthetics : this is how the idea behind The Cyclist was born. 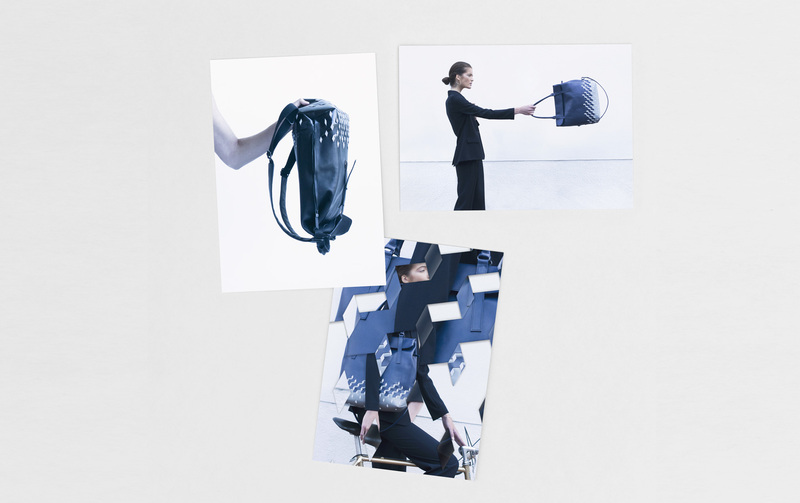 All of the bags shown on the photographs are prototypes. This campaign will enable to take the project out of the design studio and into the real world: from the prototype to the product, from the workshop to you! During the campaign, the bags will be available for pre-order. 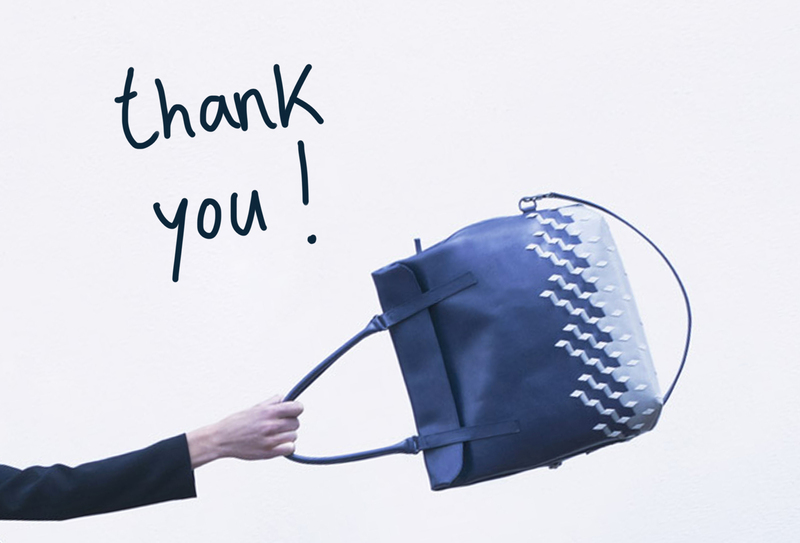 By placing a pre-order, not only will you be among the very first owners of a bag by The Cyclist: your contribution will enable the very first production of a small series of bags to turn into reality. Last but not least, the pre-order bag pricing during the campaign is lower than the estimated future retail pricing. 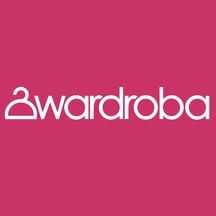 The preparation of the production will take place during and shortly after the campaign in order for the production of the first batch to start in January 2015. The bags will be shipped start of February 2015. 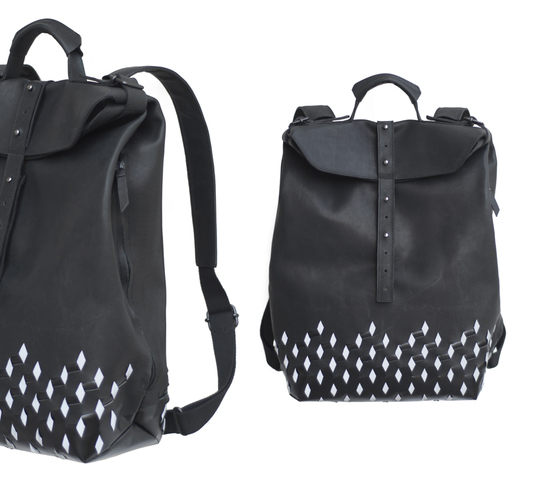 The first production of bags by The Cyclist will be a limited edition of 25 pieces. 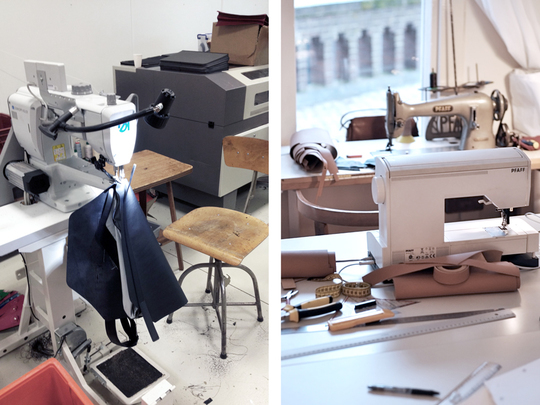 These will be produced in the Netherlands in collaboration with a leather goods manufactory: a family company specialised in hand crafted bags with more than 50 years of experience in the field. The production is done by using advanced CAD/CAM machines in combination with manual production. 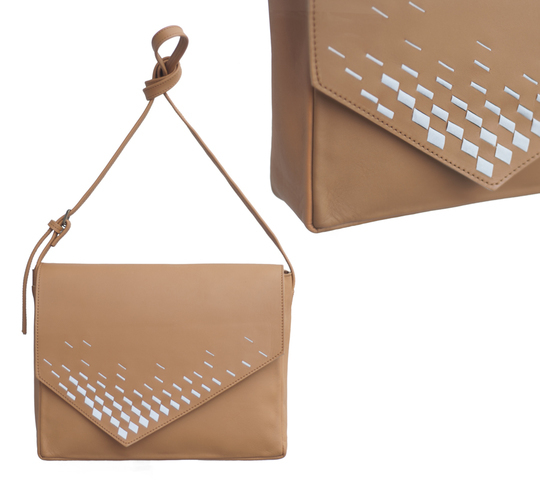 With the help of advanced tools and machines, each bag is carefully assembled manually by skilled hands. What if the campaign raises more than 4476€? If more funds are raised, it will be possible to produce more bags during the first production batch and have each bag produced in one or more extra colours for example. Also, this will enable the purchase of extra leather and material to produce new models and develop new prototypes to extend the collection. Your name on the website of The Cyclist and a set of three postcards featuring the beautiful images by photographer Emile Kirsch. 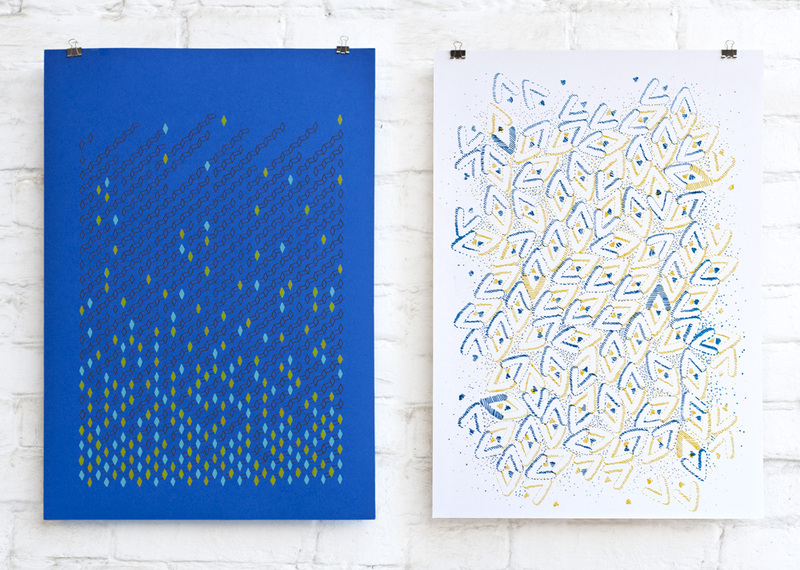 Your name on the website, a set of three postcards and a silkscreen print made by the designer of The Cyclist. The original pattern is drawn by hand. 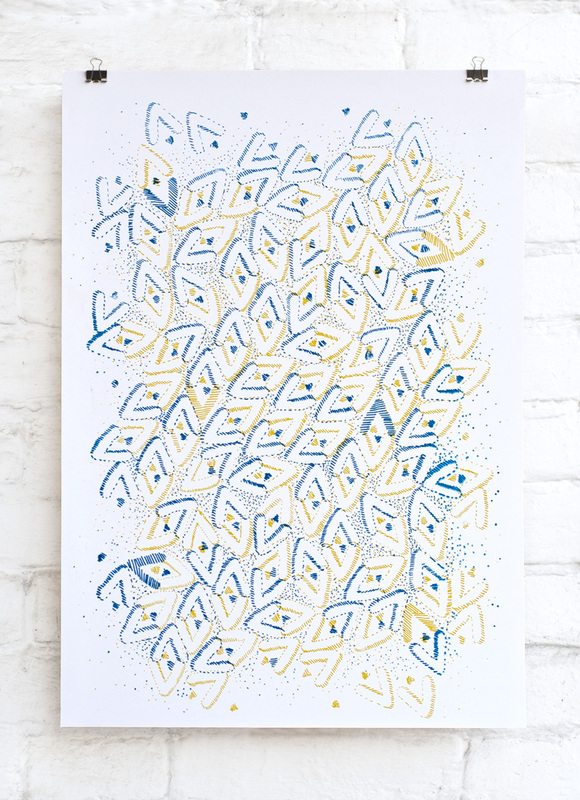 It is then silkscreen printed manually on heavy white paper, using two colours which are applied one after the other. Your name on the website, a set of three postcards and a more sophisticated silkscreen print made by the designer of The Cyclist and based on the pattern of the bags. The original pattern is drawn by hand. It is then silkscreen printed manually on high quality coloured paper, using three colours which are applied one after the other. Your name on the website, a set of three postcards and the set of two handmade silkscreen prints which feature two patterns by the designer of The Cyclist. Your name on the website, a set of three postcards, a silkscreen print based on the pattern of the bags and a shopping bag by The Cyclist. 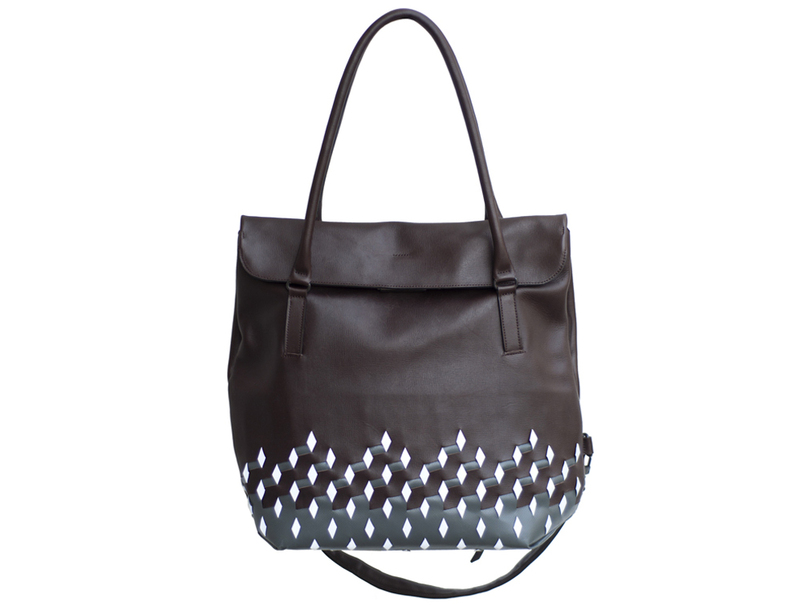 The textile shopping bag, available in white or black, has black leather handles and a leather rim. The dark grey waterproof tarpaulin bottom has a retro-reflective ribbon running around its edge. Your name on the website, a set of three postcards and your very own Claude, Maddalena or Penelope bag with a leather label featuring your name or initials inside and a day tour by bike through Rotterdam with the designer of The Cyclist. During this tour she will take you along several of the bike/design high-lights of the city and present her work and some of the techniques used to design the bags in her atelier.